While each has its pros and cons, the clash between large flat panel displays and projectors continues in higher education, with both technologies leading and lagging for specific uses and locations. Neither is perfect in all situations and both have their advantages and disadvantages. For the most part, projectors are less expensive to get for a variety of school uses and are the only choice for applications like auditoriums and theaters. On the other hand, big-screen monitors have the lead in interactivity, ease of use and power consumption. Which one prevails depends as much on the technologies involved as the rooms they will be used in. 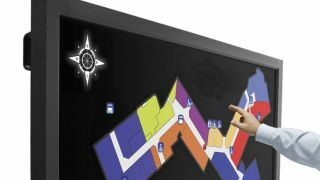 For example, a 65-inch interactive panel display might be perfectly suited for a small classroom or collaboration zones at the student union or library. In addition to never blinding the instructor or casting a shadow on the material, flat panels can be hung on a cart, stand or mounted against any wall with little or no depth needed. This can help in oddly shaped rooms that might not have the space for a traditional projector. The latest big screen displays are two-way educators that can let teachers and students interact with what’s on-screen. NEC’s 65-inch V652-TM combines HD resolution with the ability to respond to six independent touch inputs to move items around, write on the image or press to activate a selection. You can even hover your fingers over the surface and move things around. That’s because the V652-TM’s touch technology doesn’t use the expected capacitive touch sensor on the glass’s surface. Instead, it has a camera at each corner that follows the fingers of its users and can interpret when the glass is being tapped. On the other hand, at about $10,000 each, it’s out of reach for all but the best endowed universities. This is particularly the case for a large school that has hundreds of places – from classrooms to dorm common spaces – where it can be effectively deployed. This adds up to roughly $5 per square inch of work space, while even the newest and most advanced short throw interactive projectors cost no more than $2,500. That works out to less than a dollar a square inch for an 84-inch image, or one-fifth the up-front cost of a big display. They may be cheaper to get, but often projectors have hidden operating costs, like power use, lamps and rather than just hanging it on a wall, the projector needs to be set up on a wall or ceiling, often with complicated mounting hardware. You’ll also need a screen or solid whiteboard to project on and interact with. While creative AV folks at colleges have created walls of interactive displays in lecture halls and collaboration areas, one place where flat screens can’t compete is in the school’s auditoriums and theaters. Here, the large venue projector is the champ with the ability to fill huge screens for art history lectures or movie night. In fact, the trend at schools is move away from painting scenery flats to produce a backdrop for plays. They do it digitally, now, with projectors behind the scenes putting an image onto a back-projection screen that can look surprisingly realistic from the audience. The bonus is that from scene to scene, it can change in an instant without lugging things around between scenes. At the moment, it’s a tie between projectors and flat panels in colleges, with neither dominating or being outclassed. To be successful, you need to let the device fit the room.